The First Hill Streetcar has fallen another month behind schedule, due to the complexity of Seattle’s new high-tech trains. 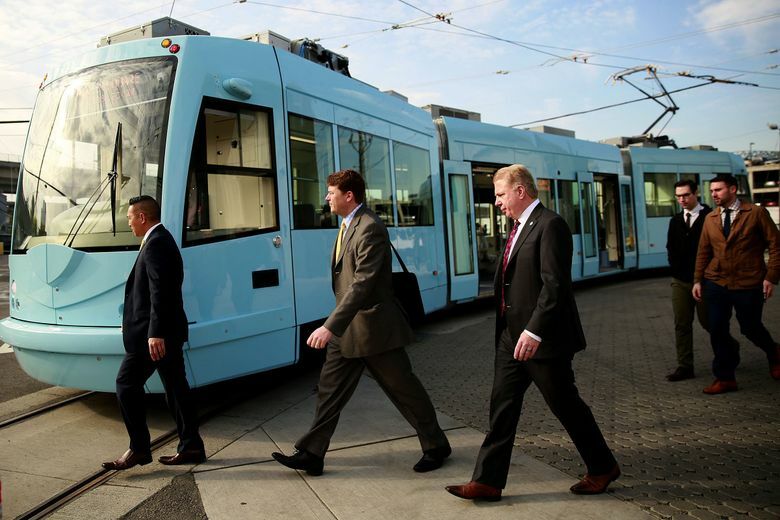 A grand opening for the First Hill Streetcar has slipped again, this time until at least August, because the builder needed more time to finish Seattle’s electrically elaborate trolleys. Transportation Director Scott Kubly said he’s still optimistic about opening the line some time this summer. “We’re not going to announce a start date until we’re positive we can hit one,” he said. The city initially said the line would open by early 2014, but suppliers fell behind on worldwide orders. They also struggled to deliver a new-generation power system that lets the First Hill trains run off-wire, on batteries. Last week, Kubly reported to the City Council that Czech Republic-based Inekon Trams Company is “about 30 days behind their original commitment to have all the cars ready by the end of June,” and the city is making “every effort” to start service in August. In addition, the $135 million project lost a week because streetcar testing equipment was held up by U.S. Customs. Sophisticated laptops, data recorders and wires arriving from the Czech Republic raised homeland-security questions because they were unfamiliar to federal inspectors, said Ethan Melone, streetcar project manager for the Seattle Department of Transportation (SDOT). The last of the trains was to reach Seattle in May, leaving time to finish testing by June. The first train, sky blue, has occasionally run the 1.6-mile route from Pioneer Square to mid-Capitol Hill since March. Three more trains are undergoing preliminary tests, one is in final assembly in Seattle, one just arrived, and the seventh is on a ship to Puget Sound after tests in Europe, Kubly said. (The seven-train order included a train that Amazon purchased for the South Lake Union line, which runs through the company’s campus. “Really, we’re optimistic, we’re excited about the progress we’ve been making,” Kubly said. Delays are related to cutting-edge technology to satisfy Seattle clients, which occasionally happens here. In 2011, toll-collection contractors on the Highway 520 bridge ran a year late, and got deadline extensions, to create leading-edge accounting and license-plate recognition software for the Washington State Department of Transportation. The ORCA transit fare card, which tracks riders for multiple agencies, took six years from contract signing to public use, in 2009. Seattle’s streetcars are among the world’s first vehicles that can run briefly off the overhead wires, by retracting the roof-mounted pantograph — a necessity to avoid the meshwork of wires above Broadway and Jackson Street that power electric buses. In fact, the entire inbound run, mainly downhill from Capitol Hill to International District/Chinatown Station, is battery-powered. Dallas has ordered two light-rail cars with off-wire technology, to debut this year, Railway Gazette reports. King County Metro has been testing electric buses that can retract their power poles, for instance, to maneuver around a stalled vehicle. The streetcar’s innovative energy system, combined with new-generation wiring and tougher fire standards, contributed to delays, Kubly said. Early testing of the blue train has brought a piece of phenomenal good news, Melone said. The regenerative brakes, akin to a Prius, conserve more power than expected on the downhill trip to arrive in Pioneer Square, so trains arrive with batteries 100 percent charged, he said. That means the trains can stay in service temporarily, even going uphill, if wires are damaged or a local outage occurs, he said. In addition, the Inekon trains have shown near-flawless performance in their seven years on the South Lake Union line. Kubly mostly forgave the earlier missed deadlines after a crisis-control trip to Europe over the winter. A contract change, signed in Seattle on Feb. 27 by the president of Inekon Group, set higher penalties for missing mid-2015 targets. The city estimates it will collect late fees of $418,000 from Inekon. These sorts of penalties can evaporate in negotiations, but SDOT insists it has leverage. According to the February contract change order, the city can be compensated for late delivery by reducing the payments it sends Inekon when each vehicle is built and tested. The project was approved by voters as part of the Sound Transit 2 plan and regional sales-tax increase in 2008. Sound Transit handed over the design and management responsibility to the city, except to demand that trains arrive every 10 minutes. The streetcar will share lanes with general traffic. Sound Transit is spending $133 million and the city $2.5 million — and SDOT predicted this spring there could be $1.6 million in cost overruns. The total is still unknown. Sound Transit’s contribution is capped, so further losses must be covered by the city. For a time, neighborhood streetcar supporters hoped SDOT would get the trains going by Pride weekend, when tens of thousands of revelers could gawk at the trains clanging past rainbow crosswalks.